Thanks to the Prescription Bluegrass Blog in the USA for the news that the committee of the European World of Bluegrass Festival (EWOB) in the Netherlands has extended the deadline for band applications by two weeks. 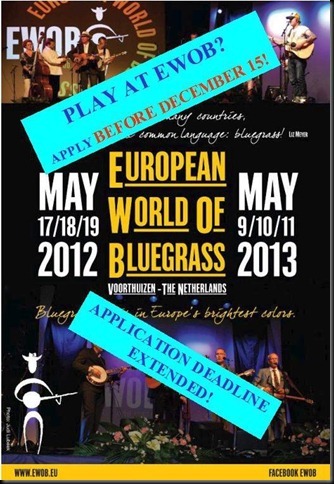 If your band wishes to play at EWOB 2013, your application should be delivered not later than 15 December 2012. All other details are as given in the EBB post of 1 Nov. 2012, where there are links to the appropriate pages on the EWOB website for downloading applications. Swing 42: new CD Déboucher! Lilly of the West: new video!